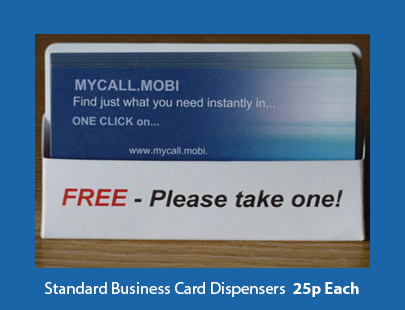 More sales for you, in a very easy cost effective way! Order Your Silent Sales Staff!.. 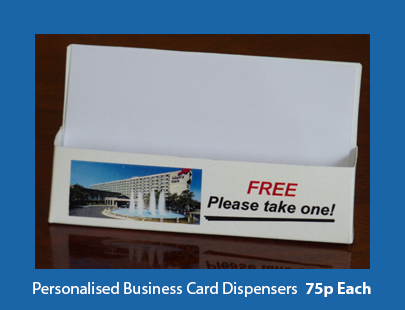 Dispensers are supplied as flat pack card, already creased, to fold and display your business cards in seconds. Size 234 pixels wide, by 60 pixels high. (80 x 20mm). .GIF, .PNG, .JPG .PDF artwork accepted. Ensure you have uploaded the correct artwork as shown in the preview then click "Upload". If you are happy with them, please, tell all your friends, and Thank you! * A refund is for the price of the dispensers returned as received within 14 days. Return postage or courier charge (if applicable) is paid by the buyer. Your privacy is respected and very important to us. We do not sell, nor make available to others, any personal details you may supply. Our Dispenser designs are Copyright (c) 2012 J.Thomas & Sons. OHIM Registered Design Patent numbers include: 002090217-0001, 002090217-0002, 002117374-0001, 002117374-0002 UK. Copyright.co.uk, also in the EU and USA. Trade and Quantities are supplied at discounted prices. IIlegal copying is theft and will be prosecuted. Copyright © J.Thomas & Sons 2015. All rights are reserved.